Met Éireann has forecasted freezing temperatures for the coming days. NOT SHAVING YOUR dog’s fur, checking their paws for cracked skin after a walk, and making sure they stay away from open fires and heaters – experts say these are just some of the basic steps you can take in order to keep your pet safe and happy during the cold weather. The advice comes as Met Éireann has forecasted freezing temperatures for the coming days, with temperatures set to dip to minus four degrees. The ISPCA is advising pet owners to opt for shorter, more frequent walks on cold days. For dogs that are comfortable wearing a jacket, owners should check regularly to make sure the jumper or jacket is not wet as a wet jumper will make your pet colder. 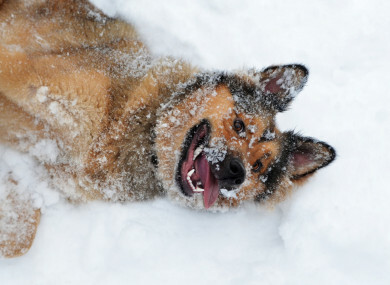 “If the temperature outside is too cold for you to stay outdoors, the same may be true for your pets. Certain dog breeds are well-adapted for cold weather, but others such as small dogs, sight hounds, short-haired dogs, older dogs or those with health problems may have less tolerance for freezing temperatures,” the ISPCA said. The animal welfare group added that owners should try not to shave their dog’s fur. If your dog coat needs regular grooming, simply trim to minimise the amount of snow, ice or salt crystals that get caught in his or her fur. Additionally, be careful not to give too many baths in winter, as they can lead to dry, flaky skin. De-icing chemicals that may have been used on the roads can cause irritation or stomach upset if pets lick it off their feet or fur, so the ISPCA has recommended owners fully wipe down their dog or cat’s paws, legs and belly to remove salt and chemicals. For de-icing products that are used at home, the likes of anti-freeze is extremely toxic to pets if ingested, but it does taste good to them. So the ISPCA recommends products that contain propylene glycol, as they are considered safer than most. During cold spells, cats will often curl up beneath the bonnet of a car when they are looking for somewhere warm to sleep. Drivers are advised to bang on their car’s bonnet or beep the horn before driving off to give sleeping cats the chance to run away. When it comes to smaller pets like rabbits and guinea pigs that are kept outdoors, their hutches or shelters should be covered to ensure they are waterproof and there are no drafts. The ISPCA has stressed that fresh water supply should be always available so owners need to regularly check that water bottles have not frozen. “It’s always best to move your pet’s shelter indoors into a shed or garage, but not in an area where cars are stored overnight as the fumes can be seriously damaging,” the animal welfare group warned. Email “We're in for some wintry weather over the weekend, here's how to keep your pet safe and happy ”. Feedback on “We're in for some wintry weather over the weekend, here's how to keep your pet safe and happy ”.